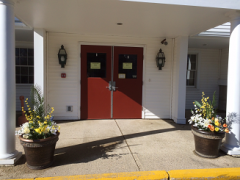 Welcome to Rye Congregational Church! All are invited to worship with us during our Sunday services at 10 a.m.
Click here for PDF copies of our Sunday Bulletins. You will be greeted by RCC members and friends. Ushers hand out bulletins that outline the service and include the announcements for the week. Large-print bulletins and hearing-aid headphones are available upon request. RCC’s entrance on the left side is handicap accessible. Ask the greeter at that door for assistance using the lift. The order of worship is included in our bulletins. 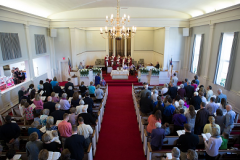 Hymnals and Bibles are located in the pews for you to follow along with the hymns and scripture readings if you wish. Music is included in the bulletin if the selections are not in the hymnals. Music is an essential part of each of our services, led by our Choir Director, Mindy McMahon, and our Organist/Accompanist, David Wold. Traditional hymns and anthems are sung in the English choral tradition. Guest musicians and vocalists frequent our services throughout the year. Communion is celebrated on the first Sunday of each month. We practice “open communion” ~ all who believe in Jesus Christ as the Son of God are invited to participate. Our invitation includes children who are accompanied by an adult who will assist them to participate with reverence and an understanding appropriate to their age. Personal choice – some wear suits and dresses while others wear jeans. Please join us for fellowship and refreshments downstairs after the service where our congregation meet and greet friends, new and old. We look forward to seeing you again!